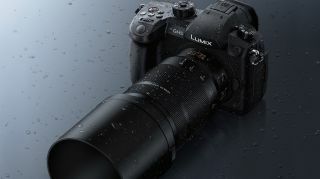 Panasonic’s has announced a new telephoto zoom for its G-series cameras, the Leica DG Vario-Elmarit 50-200mm f/2.8-4.0 ASPH. Against a Micro Four Thirds sensor, this gives it an effective focal range of 100-400mm in 35mm-equivalent terms. Protected by a dust- and splash-proof design, which is also freeze-proof down to -10ºC, the lens uses an optical construction of 21 elements in 15 groups. It features two ultra extra-low dispersion lenses, two extra-low dispersion lenses and two aspherical lenses for minimising distortion. Panasonic’s Nano Surface Coating technology is present and correct to minimise flare and ghosting, while Power O.I.S. (Optical Image Stabilizer) compensates for camera shake. It’s even more effective when working in tandem with the Dual I.S. systems on Panasonic Lumix cameras. The company claims that the lens is optimised for video recording, with an inner-focus drive system that allows it to acquire focus smoothly and silently. It's said to work especially well with cameras that use high-speed, high-precision contrast-detect AF. There’s also a micro-step drive system in the aperture control, which allows for smooth exposure adjustments when brightness levels change. Panasonic also points out the exceptional barycentric stability, which should minimise image shifts when zooming. The Leica DG Vario-Elmarit 50-200mm f/2.8-4.0 ASPH uses a nine-bladed aperture for smooth bokeh, and carries a minimum focusing distance of 0.75m. It has a 67mm filter thread, and can be paired with the 1.4x Teleconverter DMW-TC14 to expand its maximum focal range to 560mm (in 35mm equivalent terms), or the 2.0x Teleconverter DMW-TC20 to push it up to 800mm (again, 35mm equivalent). The Leica DG Vario-Elmarit 50-200mm f/2.8-4.0 ASPH will be available for Micro Four Thirds mount in metallic black from May 2018, priced at £1599 in the UK.